The video is fairly brief, but notes that it is a work in progress, and one developer notes that in the screens we saw previously, only the background lighting was active "to display the background properly", while the character lighting has not yet been set. In addition, we get an explanation of the X-like dash seen in one of the screens. "Attack them once and they get stunned", says Ikegami, and "if you close in on them with an absorption dash, you can absorb them." Makes sense. 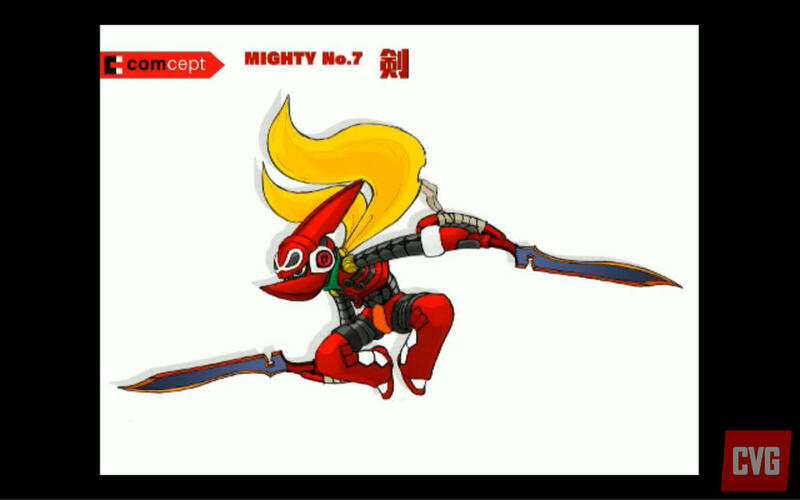 "Mighty No.7 was described as a ninja character with sharp, scissor-inspired face mask that can be removed, and twin blades in each hand." For more pictures, just click here. "Although it has very many similar elements to past titles such as Mega Man, we're trying to do something new with it," Inafune said. "Something different, something that will, in a manner of speaking, betray the fans in a good way. Completely do something unexpected, as well as keeping that classic Japanese action that people are looking forward to." Inafune wouldn't offer any specific examples of what he meant, but said to stay tuned, as new info is always coming out as they work towards the game's release, slated for April of 2015.